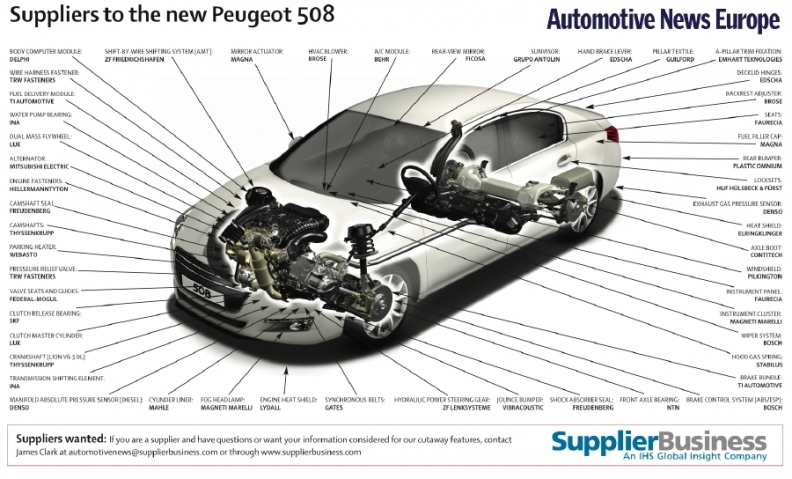 Delphi Automotive LLP is helping to enhance engine performance and lower exhaust emissions on the new Peugeot 508 with its charge air coolers (CAC). In turbocharged engine applications, the air used for the engine combustion is compressed to increase its density. The thermodynamic effect of this compression is that the temperature is increased to 220 Celsius. The U.S.-based suppliers's CAC units are designed to cool this air to further improve its density allowing more air mass flow to the engine. This makes the combustion more efficient resulting in better engine performance and lower emissions. Delphi also supplies the body computer module, switches, condenser, radiator, charge air cooler to the 508. Robert Bosch GmbH supplies the 508 with a number of key parts, including the parking aid system, the wiper systems and the control unit and injection valves on the gasoline engine. ZF Lenksysteme GmbH supplies the mid-sized car's hydraulic power steering gear and steering column, while NSK Ltd. provides the bearings for the front and rear wheels. Plastic Omnium SA supplies the 508 with a hybrid plastic tailgate, which consists of a sheet molding compound structure and a thermoplastic skin. This equipment allows up to 30 percent weight reduction compared with a steel equivalent. The use of sheet molding compound gives the tailgate the necessary rigidity to meet the mechanical specification, while the use of thermoplastic for the outer panels allows Peugeot greater freedom when it comes to body color painting. In addition to the plastic tailgate for the station wagon version of the 508, Plastic Omnium also supplies the rear bumpers for the sedan and wagon versions of the mid-sized car. The parts come from its plant located in Guichen, France, about 20km from the Peugeot's production plant in Rennes, France. The Peugeot 508 succeeds both the 407 and 607 as Peugeot's D-segment offering. The mid-sized model is part of PSA's range of cars that offer a diesel-electric hybrid powertrain. The others are the 3008 and the DS5 from sister brand Citroen.